In urban Ethiopia, many children are deprived of a safe and nurturing childhood. Families need support in the short-term to alleviate immediate need, as well as the means to improve their situation in the long-term. Addis Abeba (sometimes spelled Addis Ababa) is the capital of Ethiopia. It has a population of approaching four million and its rapid growth is expected to continue. Addis Abeba offers all the commodities of a modern metropolis: good transportation, wide boulevards and shopping malls, state-of-the-art architecture and luxury hotels. But life is very different for the thousands of slum dwellers on the outskirts of the city. Ethiopia’s Millennium Development Goals include the target of achieving 63 per cent access to safe water supply and 58 per cent access to improved sanitation by 2015. To date, however, the limited access to clean water and sewage systems continues to be a great health hazard and is partially responsible for many diseases and the high rate of infant mortality. Poverty and unemployment levels are also very high in Addis Abeba, particularly amongst women and young people. Even amongst the employed population, most families live off less than US$ 68 per month. For young girls from poor families, prostitution often seems like the only option to make some money, especially when they lack professional skills and qualifications. An estimated 150,000 prostitutes work in the city, and a large proportion of them are HIV positive. Gender inequality is still an issue: 23 per cent of women in Addis Ababa are illiterate, 22 per cent have only completed primary education, and only four per cent reach college or university level. Youth unemployment is as high as 50 per cent in urban Ethiopia. In the fight against poverty, the involvement of the next generation in social and economic processes is a crucial factor. 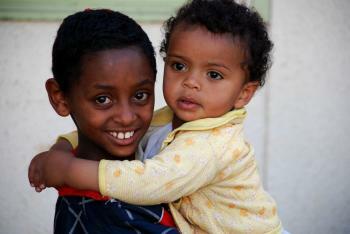 SOS Children’s Villages began its efforts in Addis Abeba in 1981. Today, our social centres here provide a family strengthening programme to members of the local community. The programme aims to help parents develop their capacities in a holistic and sustainable manner, to achieve self-reliance and economic autonomy, and to ensure access to essential services such as health care and education. We assist parents in sending their children to government-run schools, and provide guidance on income-generating activities as well as counselling and psychological support. The social centres also offer day-care, where up to 200 children are looked after while their parents are at work. The overarching aim of these services is to support families, and the community as a whole, so that children can be protected and cared for and will not be abandoned. Our medical centre here is also open to the community and serves approximately 7,000 patients each year. Amongst others, it provides the following services: a community participatory health project, reproductive health advice, ante/post natal care, and voluntary HIV testing. For children from the region who are no longer able to live with their parents, 15 SOS families can provide a loving home for up to 150 children. In each family, the children live with their brothers and sisters, affectionately cared for by their SOS mother. Together with children from the community, they attend the SOS Kindergarten here in Addis Abeba. This way, children from SOS families are integrated into the community from a young age. The SOS Vocational Training Centre Kality, located in the Addis Abeba suburbs, offers young people from all around Ethiopia the chance to complete a three-year vocational training course in one of the following fields of specialisation: furniture making, general metal fabrication and assembly, automotive engine service, automotive electricity/electronics, automotive power train and chassis service. The students receive a sound academic foundation combined with the skills of a trade, which helps to secure their future independence. The training centre also provides accommodation for up to 240 trainees. 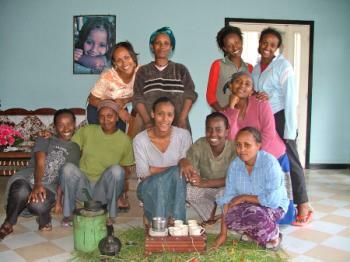 One of the SOS Staff Development Centres is also located in Addis Abeba. Future SOS mothers and co-workers receive comprehensive training here and are prepared for the important roles they will take on.